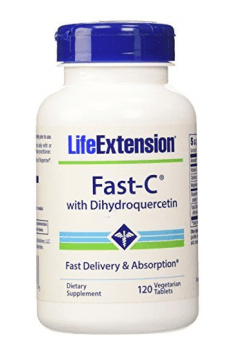 Fast-C with Dihydroquercetin 120 tab. Take one (1) tablet once or twice daily with or without food, or as recommended by a healthcare practitioner. It is a premium-class supplement of vitamin C for the most demanding users. It will work perfectly among people who complain about problems with the digestive system after taking higher doses of vitamin C.
Strong antioxidant effect is an indication to use it in the periods of excessive load of the organism or diseases. It may be helpful when we observe the first symptoms of infection or cold. Even 4 capsules may be used then during the day, taken at even time intervals.